With Peeby’s goal keeping technique coming under serious scrutiny, we presented another two shootout winners with their vouchers at the Swindon match on Saturday 3rd September. 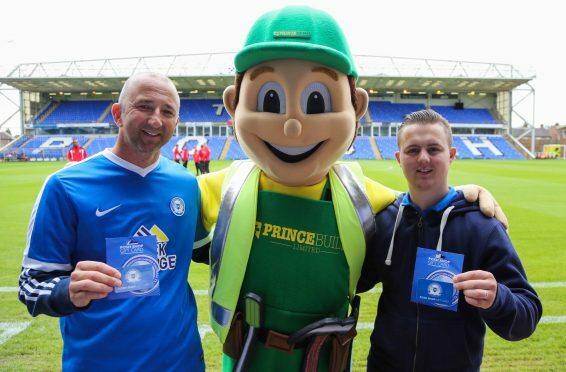 Lee Allen who put a shot past Peeby on 23rd August and Joel Edwards who scored on 30th August both collected £50 in club shop vouchers before the televised match. The half-time challenge takes place at all home games throughout the season, and each contestant gets three chances to score a penalty past Peeby. There is £50 worth of club shop vouchers up for grabs each game and if Peeby saves all the shots the vouchers roll over to the next week.